today is the first of august and that means only one thing in the eyes of my hubby: #august50. don't know about that? last august i discovered a buddy of mine that i used to work with in high school (ahem, that was 9 years ago) was challenging himself to run 50 miles in the month of august. several other people were doing it as well and documenting their miles on twitter, using the hashtag #august50. i mentioned it to KJB and he jumped in on the action. he's not a big "tweeter" but he does check his timeline every day to keep up with news and sports. surprisingly to me, he loved sharing his miles on twitter and found it motivational. this year, he's challenging himself even more by doubling his goal: 100 miles in the month of august. and i've decided to join in the party as well. i'm not quite as adventurous as him, so i'm sticking with the original 50 miles. i'm also not much of a runner, but i plan to walk & ellipticate my way to the goal line. will you join us in this challenge? 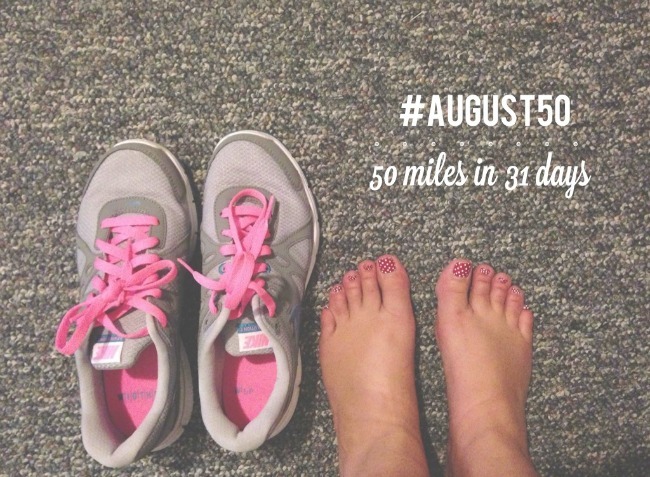 post your miles on twitter using the hashtag #august50.